Over the following decades, art museums would be designed to ensure that visitors saw art in the way Gilman thought we should. Understanding his skiascope, which embodies in oak, wire, and flannel the ideals of the modern museum, reveals the roots of modern museum display. Fig. 2. 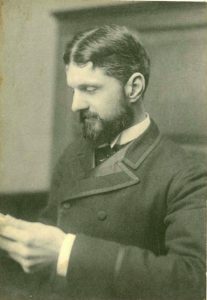 Benjamin Ives Gilman, c. 1880, Courtesy of Palisades Free Library, New York. Fig. 3. This is the type of gallery where Gilman would have experimented with his skiascope. Detroit Publishing Company Collection, Library of Congress Prints and Photographs Division. 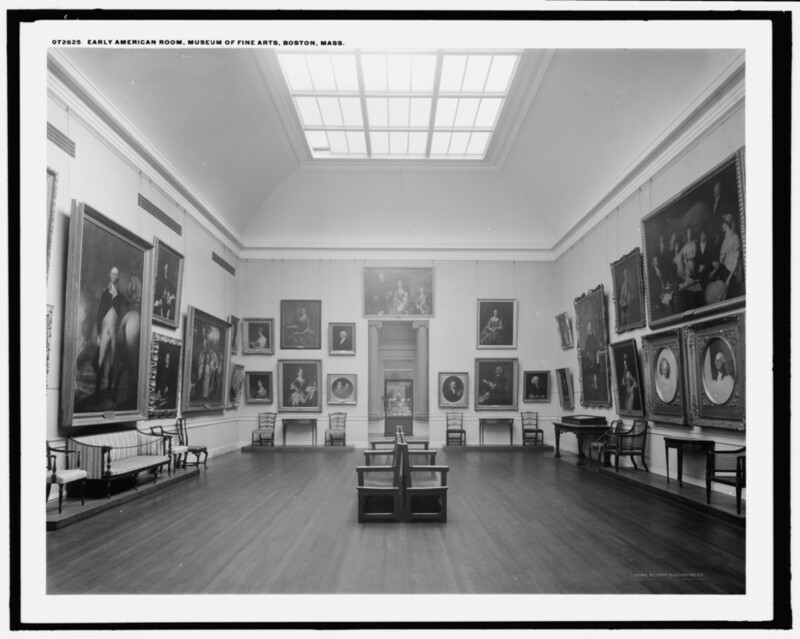 In 1893, Gilman accepted a job as a curator at the Museum of Fine Arts, Boston. He had never studied art or art history, but had done “a little cataloging” for the museum. He agonized over the offer, which he feared would mean giving up research, but took the job. He would stay at the museum for thirty-two years.16 His title and duties varied over time (curator, librarian, secretary, assistant, and acting director) but his role as intellectual authority would not. Gilman was at the center of the debates that shaped the museum and American museums more generally. 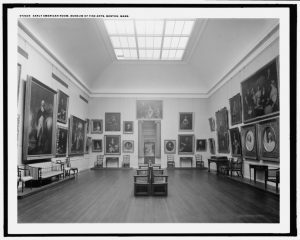 He insisted on original art, not copies; on the dual system of display that put masterpieces front and center in the gallery and moved lesser quality art to the storeroom; on the importance of connoisseurship, and the unimportance of art history; and on making the visitor comfortable by introducing docents and defeating museum fatigue. He was a prolific spokesman for these ideas, publishing widely, and speaking at the American Association of Museums.17 His Museum Ideals of Purpose and Method, published in 1917, offered the fullest explanation of his beliefs about museums. The ideas about proper viewing that Gilman offered in Museum Ideals of Purpose and Method were already present in his teaching at Clark. Shaped by the debates about attention that were the focus of the late nineteenth-century scientific psychology he had studied at Harvard, and developed through his research on music, his teaching on pain and pleasure, and his writings on aesthetics, they would in turn shape the twentieth-century art museum. Gilman unveiled the skiascope at the 1917 meeting of the American Association of Museums, in New York.19 One can imagine him taking the stage—a “lean, gentle, gray-bearded scholar,”20 fastidiously dressed—skiascope in hand. He held the device to his eyes and looked through it at an imaginary painting on the opposite wall. Future museum visitors, Gilman said, would pick up a skiascope at the entrance to a gallery, and peer through it at paintings and sculptures, and see them better. When I held my skiascope to a painting, the first effects I noticed were, indeed, less glare, and greater contrast within the painting. My eyes did not need to deal with the light coming from the wall around the art, just the light reflected from the painting itself, so there was less overall contrast to which to adjust. By blocking light that is not useful, the skiascope let my eyes focus on just the light that carried meaning—the painting itself. The skiascope sharpened my vision—each work of art stood by itself, framed by the rectangular opening of the skiascope. 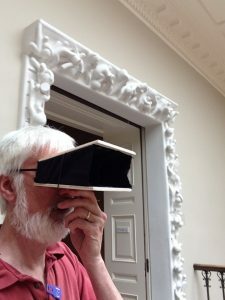 Both physically and metaphorically, the skiascope encapsulates everything Gilman thinks about museums: it blocks out all but the art. Helen Rees Leahy, in Museum Bodies: The Politics and Practices of Visiting and Viewing, notes that like many curators of his day, Gilman was concerned that visitors were not using galleries properly, that they were not paying attention, that they were not looking properly.23 The skiascope was technology that addresses that problem. On the other hand, something is lost when we limit our interactions in the museum in this way, when it is just us and the art. 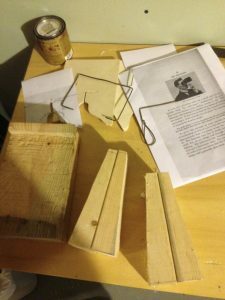 The critique of the skiascope, in so far as it has been noticed at all, is that it is simply a kind of blinder.28 It is, as my experiment with it showed, rather more than that. It offers not just a narrowed vision, but an improved vision, improved in a particular way: more focused, more intense. But in limiting our appreciation of art to the merely visual, the aesthetic, what do we miss? Or, conversely, what do we gain when we view art in a more free-form way, a more social way, a way that opens up from the art to the rest of the world, a way that offers its history and context, rather than insisting that art is separate from the world? I enjoyed my visit to the RISD Museum, skiascope in hand. In becoming Gilman’s attentive viewer, I saw new things. I understood the appeal of the device, and of the way of looking it stood for. I understood better what the transition to a modern museum might have felt like, and what was gained and lost in that transition. 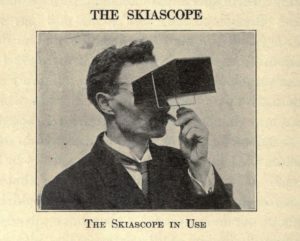 Understanding the skiascope also provided new historical insight. Exhibitions at the twentieth-century museum are rooted, in part, in the scientific psychology of James, his focus on attention. Understanding Gilman’s personal history—his transition from mathematics to psychology to music to museums—helps understand how that happened. Through the skiascope, and Gilman’s life, we can understand the roots of the modern museum in a new way. My thanks to Maureen Melton, Archives of the Museum of Fine Arts, Boston; James Stimpert, Johns Hopkins University Archives; Kathryn Brush, for her comments on an early version of this paper presented at Western University, London, Ontario; and finally, to the editors of Research Notes, for their sound advice in clarifying the ideas presented in this text. About the Author(s): Steven Lubar is Professor of American Studies, History, and History of Art and Architecture, Brown University.